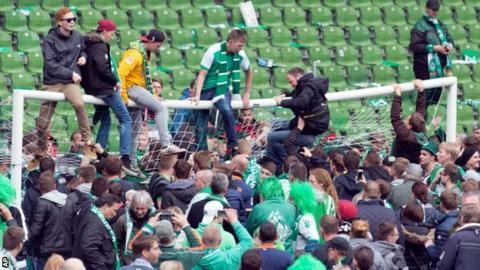 Stuttgart were relegated after 39 years in Germany's top flight as Werder Bremen pulled off a dramatic escape. Stuttgart, the 2007 Bundesliga champions, lost 3-1 on the final day at Wolfsburg to go down. Bremen, who could have been relegated, scored a late winner to beat fellow strugglers Eintracht Frankfurt 1-0 and secure safety. Eintracht finished 16th and face a promotion-relegation play-off with Nurnberg, third in the second tier. Relegated in 1975, Stuttgart secured promotion back to the top flight in 1977. Match ends, VfL Wolfsburg 3, VfB Stuttgart 1. Second Half ends, VfL Wolfsburg 3, VfB Stuttgart 1. Attempt saved. Martin Harnik (VfB Stuttgart) right footed shot from outside the box is saved in the centre of the goal. Goal! VfL Wolfsburg 3, VfB Stuttgart 1. André Schürrle (VfL Wolfsburg) left footed shot from the centre of the box to the centre of the goal. Assisted by Julian Draxler. Attempt missed. Julian Draxler (VfL Wolfsburg) header from the centre of the box is close, but misses to the right. Assisted by Vieirinha with a cross. Daniel Schwaab (VfB Stuttgart) is shown the yellow card for a bad foul. Julian Draxler (VfL Wolfsburg) wins a free kick on the left wing. Foul by Daniel Schwaab (VfB Stuttgart). Corner, VfB Stuttgart. Conceded by Koen Casteels. Attempt saved. Alexandru Maxim (VfB Stuttgart) right footed shot from outside the box is saved in the top left corner. Dante (VfL Wolfsburg) is shown the yellow card for a bad foul. Foul by Dante (VfL Wolfsburg). Boris Tashchy (VfB Stuttgart) wins a free kick in the attacking half. Koen Casteels (VfL Wolfsburg) wins a free kick in the defensive half. Foul by Boris Tashchy (VfB Stuttgart). Corner, VfB Stuttgart. Conceded by Marcel Schäfer. Foul by Josuha Guilavogui (VfL Wolfsburg). Filip Kostic (VfB Stuttgart) wins a free kick in the attacking half. Corner, VfL Wolfsburg. Conceded by Lukas Rupp. Attempt blocked. Julian Draxler (VfL Wolfsburg) right footed shot from the centre of the box is blocked. Assisted by Naldo. Hand ball by Emiliano Insúa (VfB Stuttgart). Attempt saved. Timo Baumgartl (VfB Stuttgart) header from the right side of the box is saved in the bottom right corner. Assisted by Christian Gentner. Corner, VfB Stuttgart. Conceded by Maximilian Arnold. Alexandru Maxim (VfB Stuttgart) wins a free kick in the defensive half. Corner, VfL Wolfsburg. Conceded by Mitchell Langerak. Attempt saved. Vieirinha (VfL Wolfsburg) right footed shot from the centre of the box is saved in the top centre of the goal. Assisted by Bas Dost. Attempt missed. Bas Dost (VfL Wolfsburg) right footed shot from the centre of the box misses to the right. Assisted by André Schürrle. Goal! VfL Wolfsburg 2, VfB Stuttgart 1. Daniel Didavi (VfB Stuttgart) from a free kick with a left footed shot to the bottom right corner. Foul by Naldo (VfL Wolfsburg). Martin Harnik (VfB Stuttgart) wins a free kick in the attacking half. Substitution, VfB Stuttgart. Alexandru Maxim replaces Matthias Zimmermann. Attempt missed. André Schürrle (VfL Wolfsburg) right footed shot from outside the box is too high. Assisted by Julian Draxler. Attempt missed. Matthias Zimmermann (VfB Stuttgart) right footed shot from outside the box is high and wide to the left. Substitution, VfL Wolfsburg. Julian Draxler replaces Paul Seguin. Attempt missed. Marcel Schäfer (VfL Wolfsburg) left footed shot from long range on the left is close, but misses to the left. Assisted by Christian Träsch. Hand ball by Filip Kostic (VfB Stuttgart). Substitution, VfL Wolfsburg. Christian Träsch replaces Daniel Caligiuri.